(30 Night Minimum Stay - ALL monthly reservations are subject to approval. Please call our office for details. 800-854-8843.) 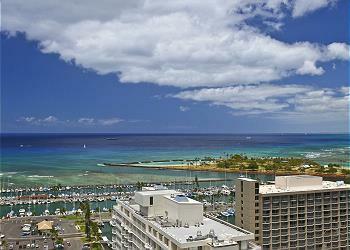 Located at the west end of Waikiki on Ala Moana Blvd, Discovery Bay has two towers of condos and a variety of floor plans for studio, one and two bedroom suites that offer wonderful ocean or mountain views. 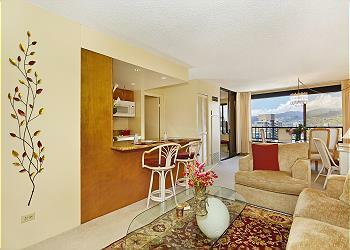 Each suite is fully furnished with linens and dishes and have full kitchens and washer/dryers. Building amenities included pool with large sun deck, Jacuzzi, sauna and weight room, Security features locked lobby, private guards and video monitoring. Parking and high speed internet included with rental. There are a few restaurants located within the Discovery Bay commercial area and several popular restaurants are across the street. Entertainment and food stores are close by. 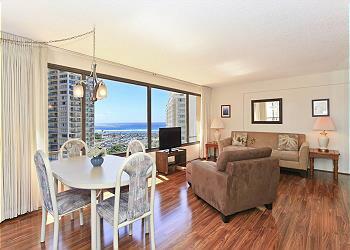 Located at the west end of Waikiki, near the marina and Ala Moana Beach park. There are many opportunities nearby for recreation and shopping. 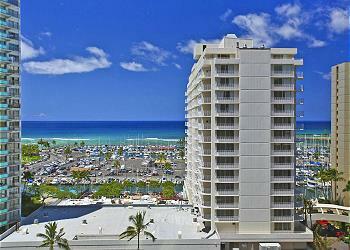 This location is very convenient to the beaches of the Ilikai and Hilton Hawaiian Village Hotels and you are within walking distance to popular Ala Moana Shopping Center and the beaches and tennis courts in Ala Moana Beach. 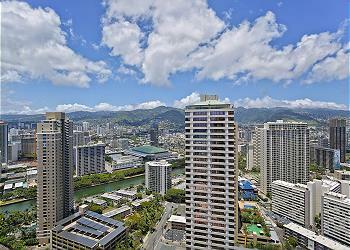 A few minutes walk or bus ride will put you in reach of all Waikiki's attractions and the beaches in central Waikiki. The bus stops at the building and across the street. Accommodations are non smoking and offered monthly.